Italian plumber and Nintendo staple Luigi doesn’t get the respect he deserves. He’s constantly overshadowed by his slightly older brother Mario who, time and time again, takes off on unpredictable adventures. Why the lack of recognition? Luigi has the same strength, agility, and determination as his twin and he’s clearly better looking, with his fuller mustache and light green attire. Sure, he can sometimes be a bit timid and cowardly but that’s only because he has to carry out ridiculous tasks like fending off ghosts in a haunted mansion with only a vacuum and flashlight. 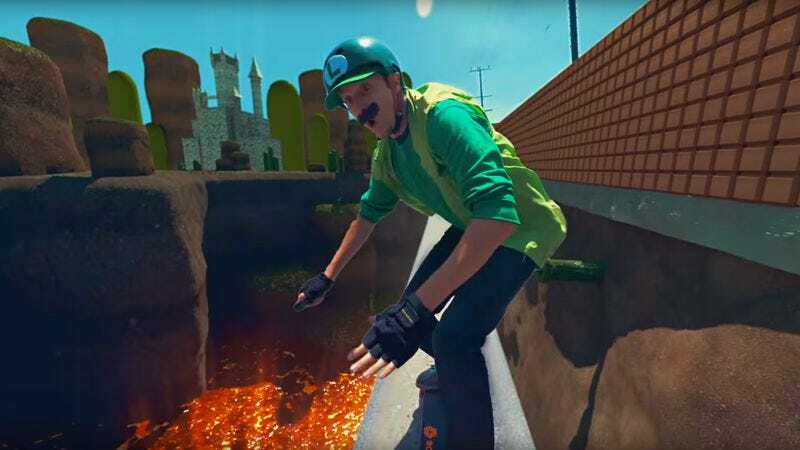 In an attempt to prove just how daring Luigi can be, Corridor Digital came up with an impressive twist on the ever-so-popular video game Mario Kart. Instead of strapping the overall-wearing hero into a gasoline-guzzling death trap, Luigi makes use of a really sweet electric longboard. The live-action video has some pretty nice visual effects and includes quite a few race track essentials like coins, power-ups, Bullet Bill, goombas, a thwomp, blocks, and a massive koopa shell. The accompanying making-of video is also worth a watch, especially for anyone interested in VFX or curious about the copious amount of work that goes into producing a video of this caliber.